North Kansas City has one of the finest Prosecutors in the Metro area. He is very fair and will amend your ticket to a defective equipment. A defective equipment which is a non-moving violation will not be reported to the Department of Revenue and will not be reported on your driving record. A defective equipment will cost you between $175.00 and $275.00. My charge for North Kansas City is $175 per ticket. You will be able to pay in cash or through PayPal. All money for fines and my fee must be paid upfront. For more information on how the process works, please go to About Us. 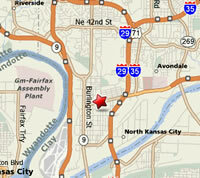 Court is scheduled in North Kansas City on Monday evenings. They have packed dockets and the wait to see a Judge may be extremely long. You will not have to appear for a speeding ticket. The best of America’s past and future can be realized today in North Kansas City. North Kansas City is as America was — safe, well-kept neighborhoods, thriving industry, responsive government, low taxes, and friendly, personable shops and services. North Kansas City is as America aspires to be — state-of-the-art corporate and medical facilities, uncongested, modern transportation, an environmentally conscious community, and easy access to a host of free cultural, recreational, and fitness amenities. Over 80 years of continual community improvement and refinement has made PROGRESS a North Kansas City tradition.